Angelo Ponticelli is an Italian carver, born in Naples in 1978, but now living in Friuli - Moggio Udinese, northeastern Italy. 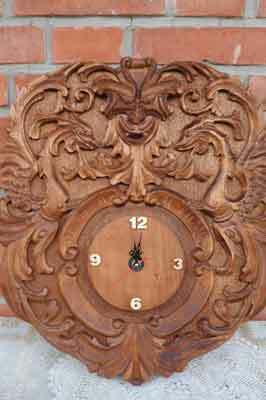 He started to carve in 2007 and day-by-day he develops his skill through studying, experimenting and discussion with other Italian and international carvers. Angelo spends every moment of his spare time enjoying his hobby, which he hopes will be his full-time commitment, sooner or later. He prefers to carve local traditional woods, like walnut (Juglans regia), hazel (Corylus avellana), cherry (Prunus spp. ), linden (Tilia vulgaris) and pine (Pinus spp.). He says that carving makes him feel at peace with the whole world, nature and himself and every time he looks at one of his works, it reminds him of the positive vibrations he felt while carving it. 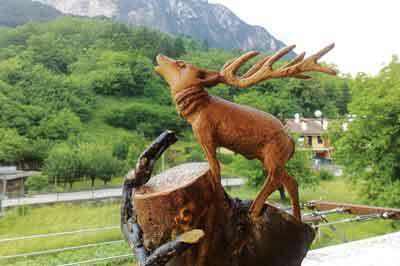 About 16 years ago I discovered the carving art in Aosta Valley in northwestern Italy. Since that very first moment I have found myself deeply involved in everything related with working with wood and I decided that I would try to be a woodcarver myself. In the beginning I attended some courses, but I still learn every day by practising carving and discussing with people who share my passion. 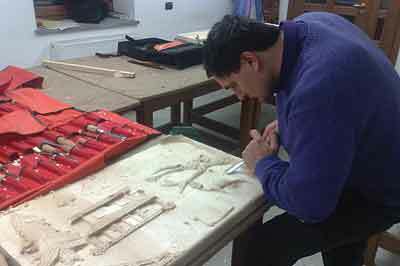 I have to mention my tutor, Maestro Giusto Rilevanti, who taught me the basic skills, techniques and, above all, the love for carving. I really feel that every single piece of wood I am going to carve is telling me its special story, giving me unique positive vibrations. I used to say that the core of my wood is like the heart of a person. Actually, the word 'core' and the Italian word for heart, 'cuore', are quite similar! 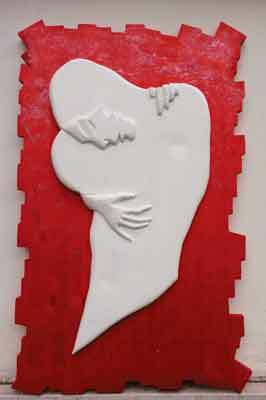 At the present I have an interpretation of Klimt's 'The Kiss' that is ongoing. Take everything but leave me the gouge! In my opinion it is the most vital tool for carving. I am extremely proud of a couple of Baroque-style cassions and a clock carved with some dragons I have spent months working on them, but they deserved it all. I really love all my Maestro Giusto Rilevanti's masterpieces. Describe the view from your workshop/bench. I am a lucky man: I am a proud owner of a former hunter's hut surrounded by wild woods. It is a magical place to be and carve, just in front of my beloved mountains. I use all my spare time for carving, but I try to also find time for football matches and mountain trekking. Do you communicate with many other carvers? 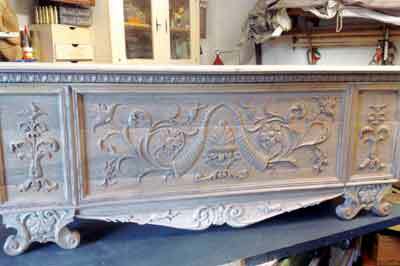 I have links with many carvers from various countries. For keeping in touch with them, I created a Facebook group - so far we are close to 800 members! My humble advice to other carvers is to keep on carving, because a piece of wood carved with love will never let you down - it will always teach you something new and positive.